We were on our way home from church and Henry and I were talking. "What did you learn about in Sunday school, baby?" 'That Jesus lives in ME!" "He Does! That's good! Does he live in your heart?" "Yes. And they both live in heaven." "Can we go to there?" "To heaven? No baby, we can't go there until we die. But we will all be together again someday." When we got out of the car he picked up a rock. I asked what he was doing and he said "I am going to paint this for Aunt Mimi. She will love it." Just some of her favorite things. And we know she does not need these material things, but oh how it helped to feel we were surrounding her with love. So in that moment, with him standing there with his rock, I understood what he needed. He needed to paint it because it was his way of telling her again how much he loves her and misses her. That two months later, he misses her more, and so he is looking for a way to show her. Even though in our hearts we understand she knows. For us... we need a tangible way to say it again and again. I write blog posts. 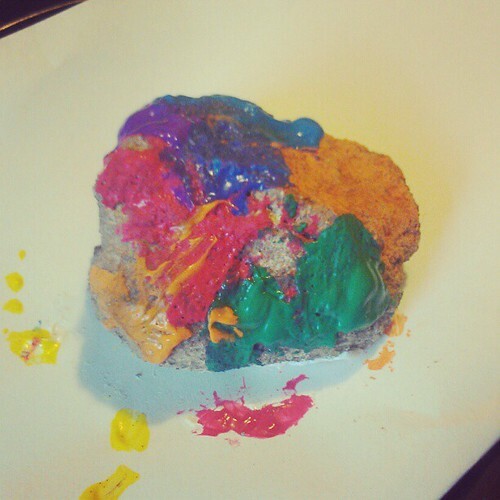 Henry paints rocks. I think someday there may be a painted rock garden at the cemetery. For this week, we will start with this one. What a wonderful, beautiful post. It's a beautiful rock. A beautiful post.